I thought I was dreaming. You usually think that your dreaming with this stuff. I don't remember breaking away from my body but I remember floating beside my bed, watching myself sleeping. My sleeping self was in a distinct position. The left side of my face was resting agaisnt my palm. 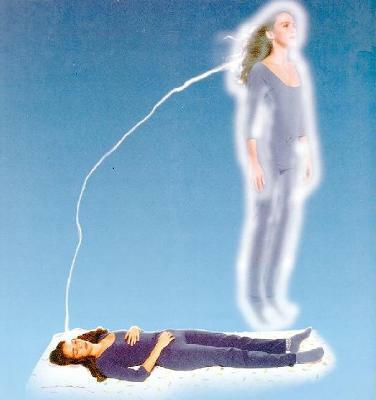 I remember seeing a long silver rope of some kind connected from the navel area of my sleeping self and to some kind of essence of me (I don't know where because I didn't have a body). I later learned that this was called the 'silver cord' and is the cord that connects one to their body. I noticed that I could see and sense everything. I mean EVERYTHING it was incredible, I could almost see better than my real self! A moment later I rushed into the back of my body and then suddenly my real self's eyes opened and I felt a whack or jolt slam into my back. I quickly realised that the left side of my face was resting against my palm. I could also feel the old presence of something resting behind me on the bed. It (I think) was the presence of my soul, which would explain why I felt calm and felt no threat. The experience was so vivid and incredible. Afterward I then learnt more about Astro Projecting/travelling and am currently practicing doing this conscious and have been quite successful. It is an amazing experience where you feel so free, alive and REAL. You feel yourself at last. Comments for I saw myself! It is an amazing experience because it really shows us so much that we are more than just our body and opens us to really knowing more about ourselves. It happened just now. I was sleeping and suddenly started to see myself sleeping. I was right there inside my room . I even made by body float ,made my bunny play with me but the thing is I felt presence of some other person to whom I am not able to remember. Maybe it was the soul of my rabbit.